Cracked or broken teeth can cause functional and cosmetic problems, and one option for repairing this damage is a crown. Crowns can restore a tooth’s size, shape and strength, improve the appearance of a smile, relieve pain, prevent further damage and increase functionality by providing proper bite alignment. Porcelain fused to metal crowns cost an average of $500 to $1500 per tooth, averaging $1100 without insurance and $650 with. 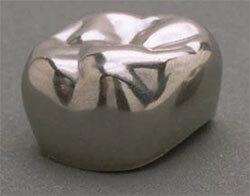 Metal (noble or high noble) crowns cost between $750 to $2400, averaging $1400 without insurance and $900 with. At the higher end, all-porcelain crowns cost between $1000 to $3000, averaging $1600 without insurance and $1000 with due to the greater time and skill required to install them. Dental insurance can cover up to 50% of the cost if it is required for medical reasons. Cosmetic procedures are typically not covered. A crown (“cap”) is a tooth-shaped dental restoration that is used for capping or completely encasing a single damaged tooth or dental implant. 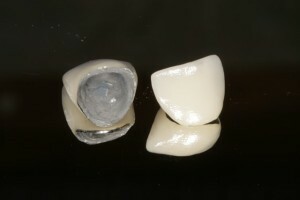 Also called “dental caps” and “porcelain jackets”, they can be made from a variety of materials and are permanently bonded to their foundation with dental cement, avoiding the need for tooth extraction, bridges, partials or dentures. They cannot be used for full-mouth restoration. Commonly a gold alloy, palladium, or other base-metal alloy such as chromium or nickel, metal crowns are typically used for back molars as individuals want their metallic color to be out-of-sight. 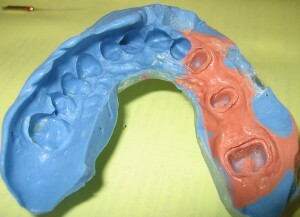 They have thinner walls, so they require less tooth reshaping and removal prior to fitting. They stand up better to chewing, rarely chip, last the longest and cause very little damage to opposing teeth. After the procedure, a number of problems can occur that require returning to the dentist for repairs or replacement restorations. Crowns can chip, become loose and even fall off. 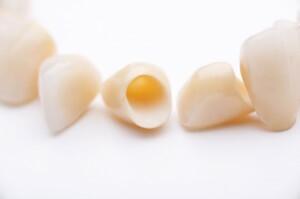 Usually seen in all-porcelain crowns, chipping can be repaired with composite resin. A replacement may be necessary if the damage is extensive. 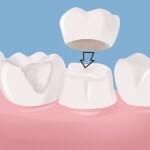 A crown can become loose or detach due to improper placement, a lack of cement or cement washing out from under it. These issues can usually be fixed by re-cementing it in place. If not, a new crown will be made. If the problem is ignored for too long, the underlying tooth may experience further damage, in which case the procedure must be redone. Have you had a tooth crowned? Has your dentist recommended you get one? Share your experience by leaving a comment! Nowadays, a lot of people in the USA fly elsewhere for what is increasingly popular, known as dental tourism. Thailand, India, Mexico are just some of the places you can go, where you can save massive amounts of money on great dental care. I had one tooth crack, and now need one crown. For a little while, before I went to the dentist, I was worried I’d need a lot done. If I did, I’d already be reserving flights to Cancun, where they have a few great dental offices that are known for dental tourism with incredibly good rates, a location near the major tourist hotels, dentists that all speak fluent English, filtered water in their plumbing systems for Americans, etc. You can fly to Cancun, stay in a great hotel, enjoy a holiday (when you’re not recovering from dental office time), and still save boatloads of money on dental work. Fortunately, I only need one crown, so I’ll get it done near home. For me the break-even would have been around 2 to 3 crowns. And if the price is the same, hell, I’m goin’ to Cancun! If I needed an entire mouth’s worth… I’d probably fly to Goa, India (a beach town) and get it all done there for ~15-20c on the dollar. “I set it wrong.” He proceded to remove it, with chiseling, drilling, and prying, with me in great discomfort. When I could talk, I said “You set it wrong?” Then I said how many times do you have to try to get it right? This showed me my discomfort with the whole plan and dentist. I have gone back to my old dentist. Think twice about cosmetic dentistry. There is possibly slight error in the types of crowns listed here based on what I’ve read at other places. My dentist recommended a zirconia crown. It is a white metal and is currently the strongest available material. Some people do consider it more ceramic than metal, but it is not weak and liable to chip like other ceramics.